Google added a new cool feature in its maps Google apps. 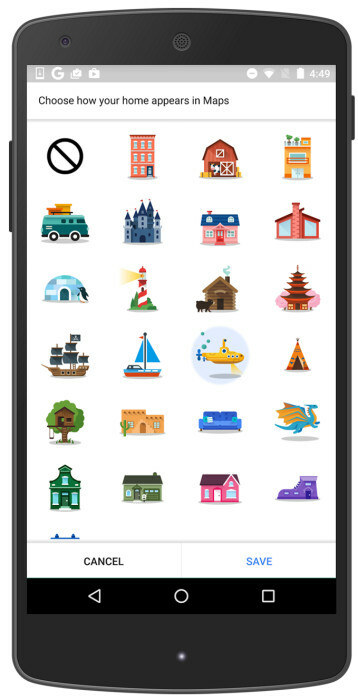 The latest update in the app will allow users to choose an icon from a set of cool icons in order to label their favorite Google Maps places with them in the free Google Maps. In addition to that, you will also be able to rename your favorite locations and my location Google maps also now allows to label favorite location with stickers. All these days, the locations that are saved as home and work addresses have been labelled with the default icons respectively. Here on wards, you will be able to change those icons if you find them boring and replace them with your desired icon from the collection of stickers and icons. Have you ever thought of living in an igloo? Well, the Google Maps will now allow you to do it by labeling your home location with an igloo icon. These icons cannot be called as very special. But they can be used to replace the default boring icons and make your apps little more colorful. It is easy as one-two-three to label your locations with icons. Saving the my location Google maps address will make things easier for you to add location on Google Map. To add a label you will have to type the address followed by clicking your favorite location in the map. You will then have to tap the hamburger menu icon in the top right corner in order to label your desired location. Google Maps app is certainly a help for those of us who travel a lot. It helps us to navigate to our destination without having to ask anyone. The integration of this label feature will certainly add more colors to our exploring journeys which are never ending. Let us know your views on the integration of Stickers in Google Maps places in the comments section below. We would like to hear from you.